School is back today, but we have just had an interesting long weekend. Friday afternoon I had a very relaxed paddle in the sun with Demelza, Kira, Tarquin, Dave and his two kids Sam and Zak. The water level is quite low now, so you don’t get pushed around so much, but its not too rocky either. 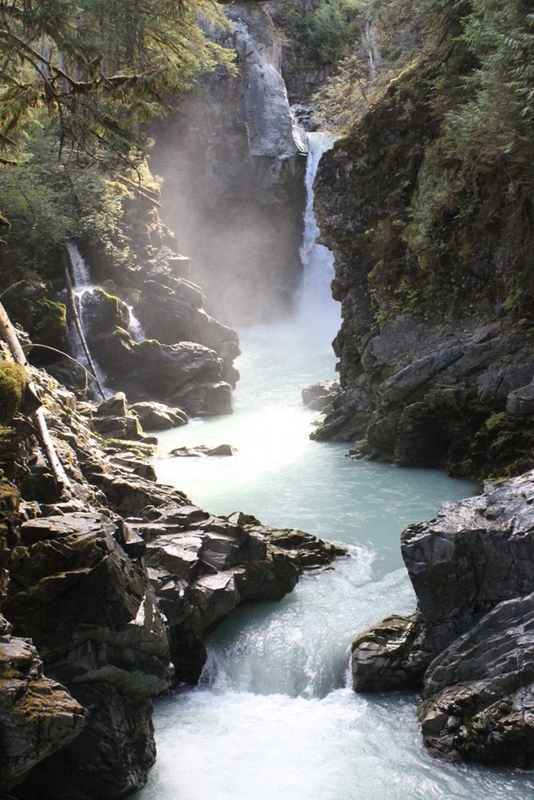 The colour of the water is now Opalescent Turquoise We all camped the night at on the river bank and had a fire (defying the marshmellow ban). Saturday morning those of us with bikes rode the “Farside” trail – about an hour of technical up and down mountain biking. 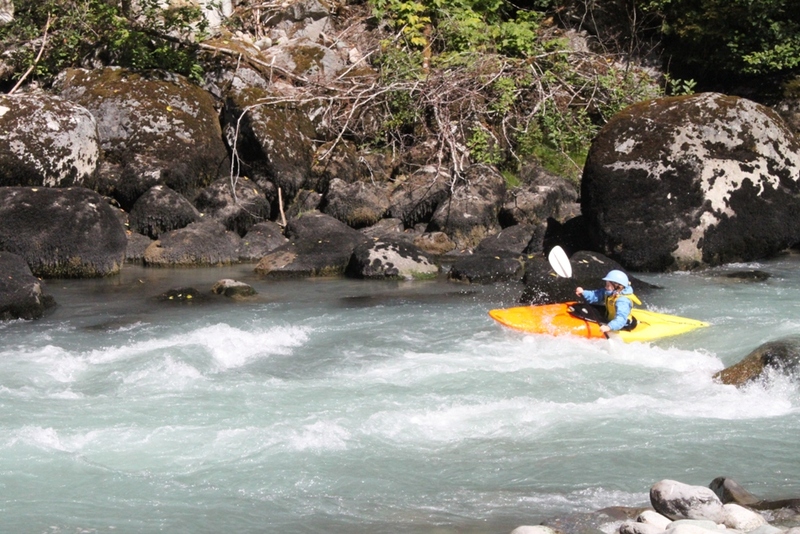 THEN it was time for a downriver run to Squamish (the first long paddle Demelza and I have done). Joined by Sally from Coast River Kayak we started on the course (I capsized while out of breath, and totally failed to roll…) then spent a couple of hours slowly paddling back to the put-out near our house. 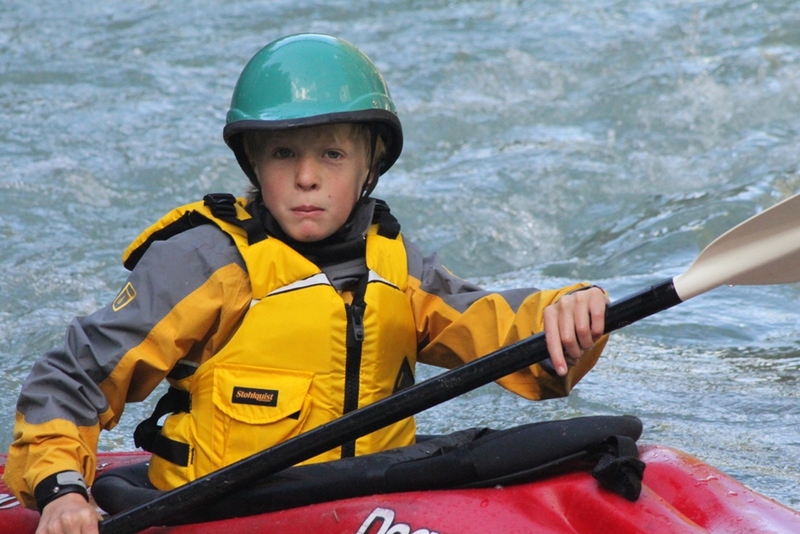 The kids have named the rapids on that run “Skittles” (something to do with food) and “Tarkies Terror”, because he was afraid of it – but he did it when I watched (missing the big rock). We all had a pretty early night. Which we needed because on Sunday morning we braved the cold and met up with Karen (Sam and Zak’s mum this time) at a secluded cliff “Fern Gully” Demelza led one of the easy routes & we did two more. The kids all shot up them all as ever. Alfie got half way up the 5.4. After lunch (bread tuna and cheese, just for a change) we moved to Ronin and took some photos on the classic “Ridge Runner”. I led two routes between Deep Breakfast and Ridge Runner — I especially enjoyed the hard slab/face “Ne’r do well” which is new since the guide book. 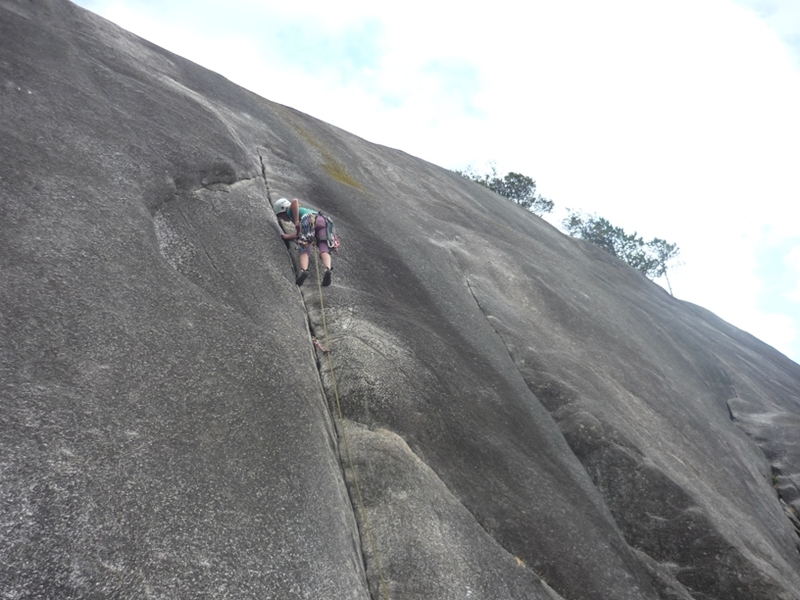 I was almost falling the whole way up, using my newest shoes to stand on tiny crystals (10d at least I think!). That night we all went out for Fish and Chips. and raced down it. I got a little too much rotation on a steep bump (about 6 minutes and a bit in on the video?) and landed directly on my head. Lying on the ground all I could think was to yell at Tarquin to slow down, as if the same thing would happen to him (which it wouldn’t because he has way more BMX still than me). Today I am nursing a sore upper back and wrist, but nothing is broken. 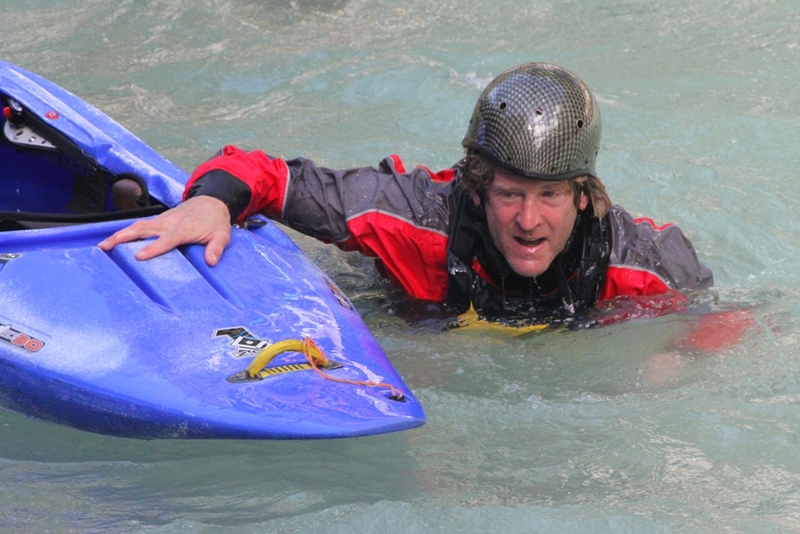 Maybe all weekends here are not quite so full of outdoor sport, but there is certainly lots of opportunity! 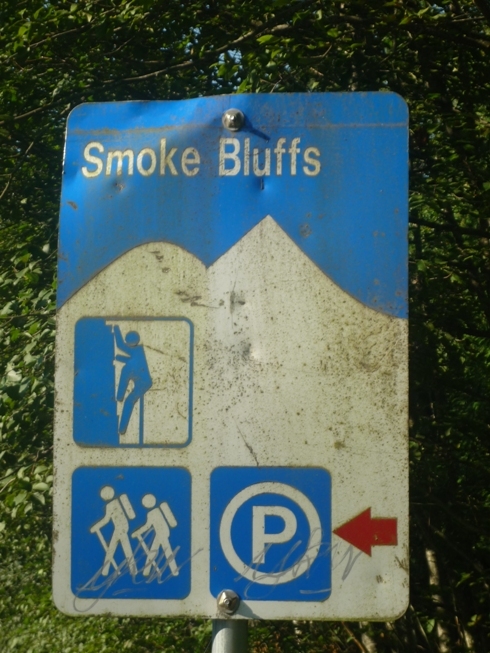 I had never even heard of the Smoke Bluffs until we lived in Canada. 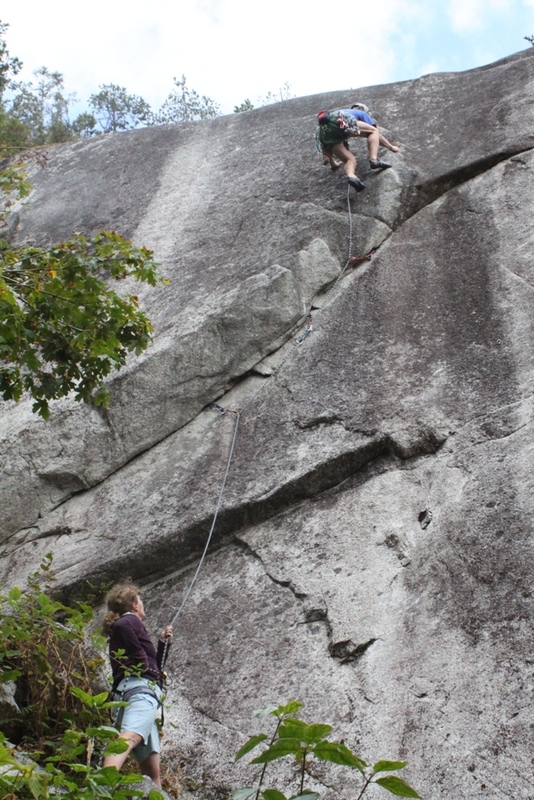 They are a park/crag that is about 20 minutes away from our house by bike, on the east side of Squamish. Nestled in the trees is a truly stunning assortment of small (well 20 to 40m, so small by Squamish standards) granite outcrops with some of the best crack and slab climbing anywhere. 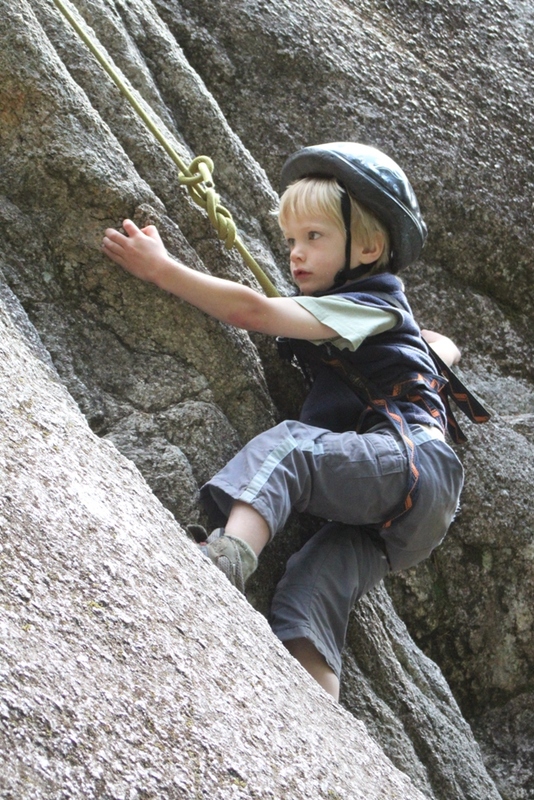 The park has been established and maintained by dedicated volunteers led by long time local climber Brian Moorhead. (I climbed with his son Colin at Arapiles in 1996!). The kids and I have been spending quite a lot of time here this summer, as there has been little rain (I just counted, there are 37 4-starred routes up to 5.11a in the book, and between us we have led 31 of those so far…). 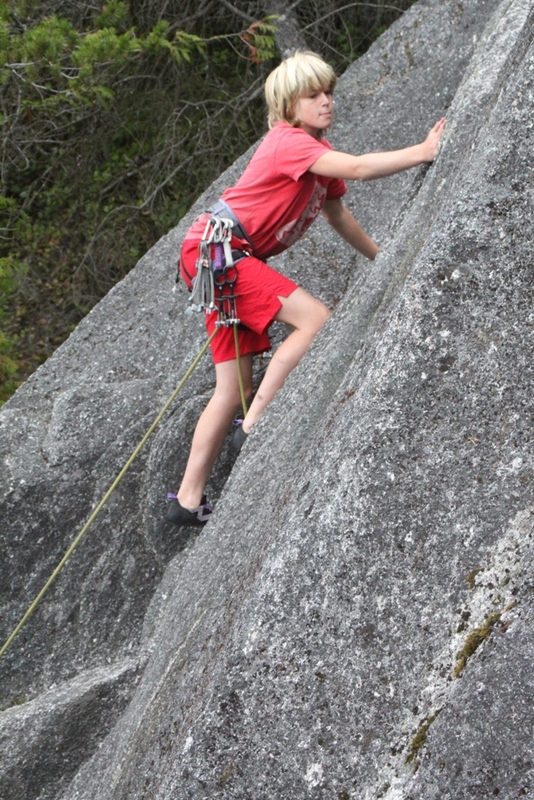 The kids are fascinated by natural gear, so Kira led “Burgers and Frys” the other day (a runout 5.7) placing her own gear. Tarquin led the brilliant “Dusty Eyes” 5.4, and Demelza led the flaketo the right of that “Wisecrack” 5.7, all in good style. The rock here takes pro really well, and is the perfect place to learn these black arts. 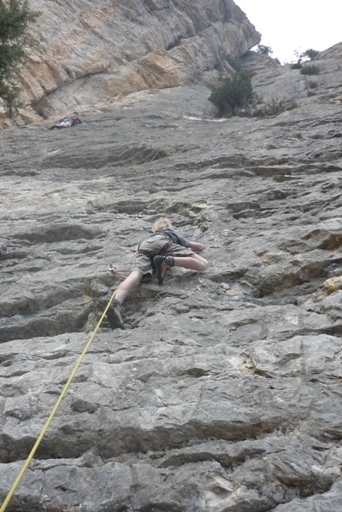 Some of my other favorites are “Geritol” 5.9 (take 2 ropes), “Yorkshire Gripper” 5.11c (I seconded this one, a good idea! 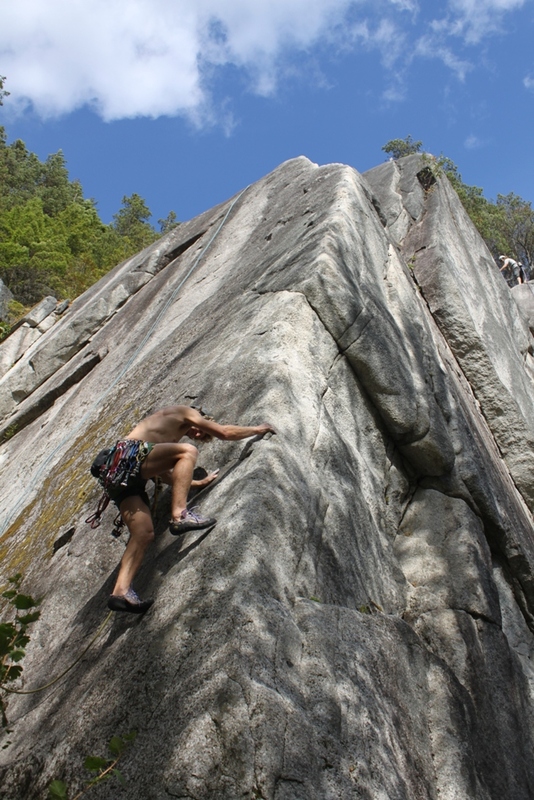 ), “Power Windows” 5.11a (My foot just slipped near that bolt, ok! ), “Penny Lane” 5.9 (you have to do this one), “Partners in Crime”, 5.11a, (my best crack O/S – ever, and one of the cleanest crack lines I have ever seen), “Supervalue”, 5.10d (hard, and then more hard!! 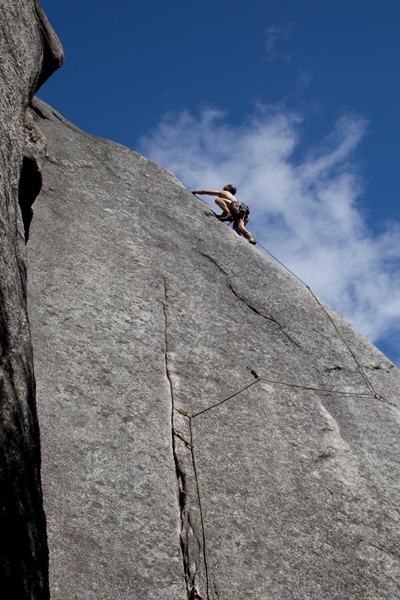 ), “Triage Arete” 5.9 (not so popular before the 4 bolts apparently, as it is you don’t want to fall off this). The O/S failures are “Power Windows” 11a (great fun anyway), “Skydancing” 10d (I couldn’t even get to the first bolt – stick required), and “Climb and Punishment” 10d (A good route – check out the Peter Croft madness above it!). Apart from that we’ve onsighted 40 something of the 3 star routes and have about 25 left including the famous “Wonderland”, “Popeye and the Raven” (which always seems to be busy,) and the intruiging looking 11a, “Kangaroo Corner”. We are so lucky to have so many great routes so close to home – thanks to all the volunteers and route developers who have made this great area. The kids were asleep, so rather than taking them up Panorama Ridge (2130m) as discussed, I decided to hike up to have a look at the Black Tusk (2320m) alone. I had met some climbers the day before who recommended Mt Price – 2050m – but the route to it was indistinct and snowy. The route to the ‘tusk’ was more south facing so I figured on less snow – plus it is a very attractive peak from a distance. I was wrong on both counts, the walk up was snowy and I lost the trail several times, but following my nose seemed to find it again. There were some great grassy patches higher up, with small pine trees, great bear country, but I didn’t see any. I am really enjoying moving fast in this lovely terrain. The lack of a pole, or axe brought back memories of sliding down snow slopes before, but it really wasn’t steep or icy (I carried a pointy rock for peace of mind) and the bushwalking boots were fine. After about 2 hours I got to the base of the scree, and decided to scramble up it a little: one step up, 1/2 step sliding back (but it makes a great sound), this thing is a huge pile of small hard black rocks. 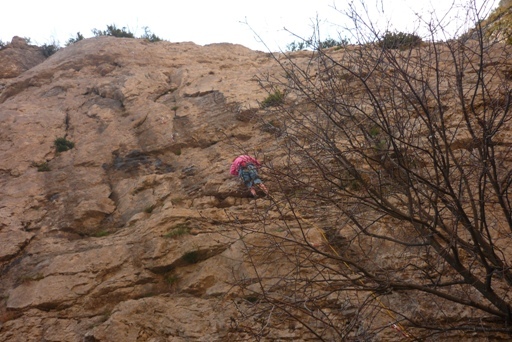 30 minutes later I am at a rockface – loose and clearly unclimbable. I walked around to the right for 50m or so and find a short steep chimney of better rock – surely this isn’t the ‘scramble’ so many people do? 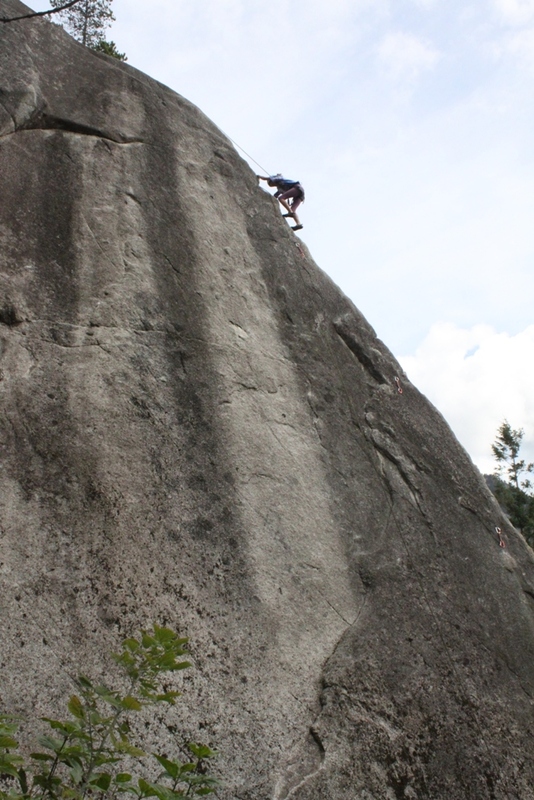 I decide to climb this 5m to ‘have a look’, its steep but not hard (5.5? ), pulling up onto what feels like the scree again. The terrain is lots of flutes of terrible rock that are all about 45 degrees from vertical: the climbing looks easy, if a little dangerous, and I am worried about finding the way back to the top of the chimney, so I build a small cairn. Another 15 minutes and I am at the top, and take a photo of the ‘Olympic’ cairns. You can see everything Whistler / Tantalus / Mt Price / The Garabalidi’s. I don’t linger. I realise down-climbing that you could not have more than one person on this thing, each step sends a cascade of rock down, the chimney would be a shower of rocks (my carin was destroyed). I enjoy climbing down the little chimney, and then running down the scree (in about 5 minutes, I undo 30 minutes of up). I kept two rocks. I meet two hikers on the way down, with lots of tattoos. The snow is perfect for glissading too (all though by now my inexplicabley sort right leg is really hurting) and I am back at Taylor Meadows pretty quick (in all 3 hours to the summit, and 90 minutes down). A great outing, in an interesting location, on an eroded volcanic remnant. I wouldn’t feel the need to do it again. Alfie leads the way on the long run back to the carpark, chatting all the way (until he got ‘tired legs’ in the last couple of km!). At Orpierre Kira and Tarquin both led there first routes. Its perfect for it. Lots of Fr 5a to 5c, lots of bolts, and sunshine (Well actually it was unseasonally really cold – on the first day it snowed – a lot! ).